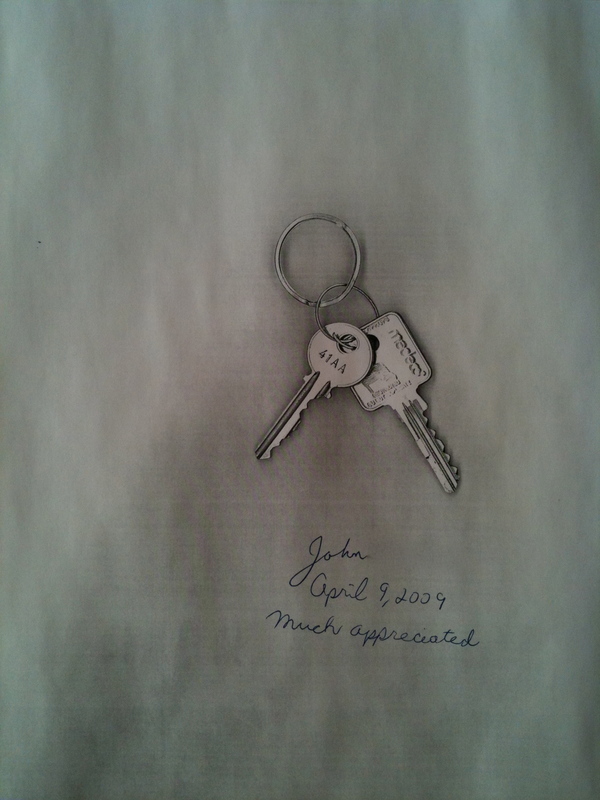 There is no symbol more reflective of the end of homelessness than a set of keys. As Manager of the Client Advocacy Project (CAP) at Coalition for the Homeless in New York City, I had the privilege of leading a team that helped put keys in the hands of over 100 homeless men and women. These single adults, either street homeless or languishing in the city’s municipal shelter system, lived with a range of physical, mental, and emotional disabilities. With a housing stock that to this day is grossly inadequate, this was no small accomplishment, and I am extremely proud of the team of dedicated individuals who made this possible. The primary goals of the CAP were to secure federal disability benefits for those who, with appropriate advocacy, were eligible, and to leverage those benefits into a move to supportive, supported, transitional, or independent housing. The timelines involved were quite long—3 to 5 months for an initial application for benefits and two to four years to appeal the denial of benefits—sometimes longer. This being the case, in providing intensive case management for our clients we got to know them very well. One such client, who I’ll call Mr. Franklin, came to the CAP through the Coalition’s Crisis Intervention Program. Five days a week, homeless single adults, couples, and families would line up to receive services, referrals, or advice at the Coalition’s office at 129 Fulton Street in lower Manhattan. Mr. Franklin, a lean muscular man of about 50, had been on the street for a few years and was living with schizoaffective disorder. He was tired of being on the street, but refused to enter the shelter system. “I’m safer on the street,” he told me. For some, I knew that was true. He also was suspicious of “the system” and unwilling to “jump through all the hoops” that were held up as a condition of shelter. Despite our willingness to advocate for him and the fact that a number of newly sheltered and formerly street homeless individuals were willing to vouch for our program, Mr. Franklin chose to do it his way and remain on the street—of course, we stuck with him every step of the way. Through our advocacy and with the assistance of our partners at The Legal Aid Society, Mr. Franklin was awarded disability benefits 18 months after coming to the CAP for assistance. Three months later, together we were able to secure a studio apartment for him in the Bronx with on-site social services—what a victory! 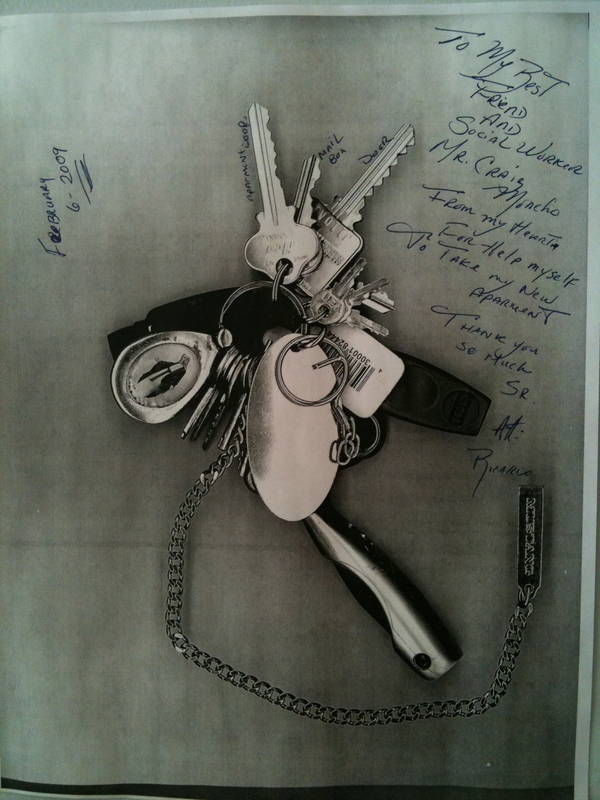 I placed Mr. Franklin’s keys in the center of the glass on the copy machine, fanning them into a semi-circle—three keys in all. 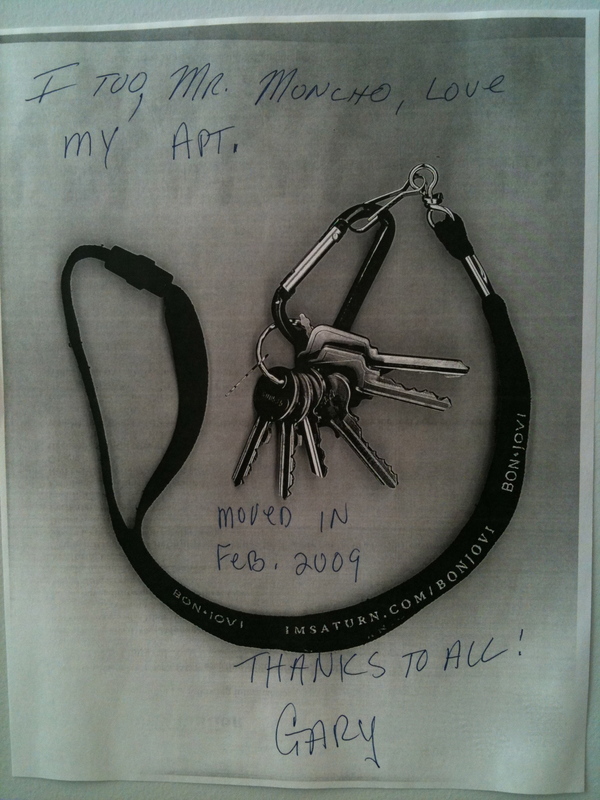 Then I took the long cord they were attached to, which he wore around his neck, and circled the keys. Mr. Franklin took the six copies and sat down to write. A few minutes later, he handed me a copy with a note of thanks. “You saved my life. I love my apartment. Thank you. Franklin B.” It brought tears to my eyes. Mr. Franklin took the other five copies he had personally inscribed and gave them to the five staffers who had helped him in various ways. We were all so excited and touched, we were like little kids! I asked Mr. Franklin if he minded if I put the picture up on the wall in my office. 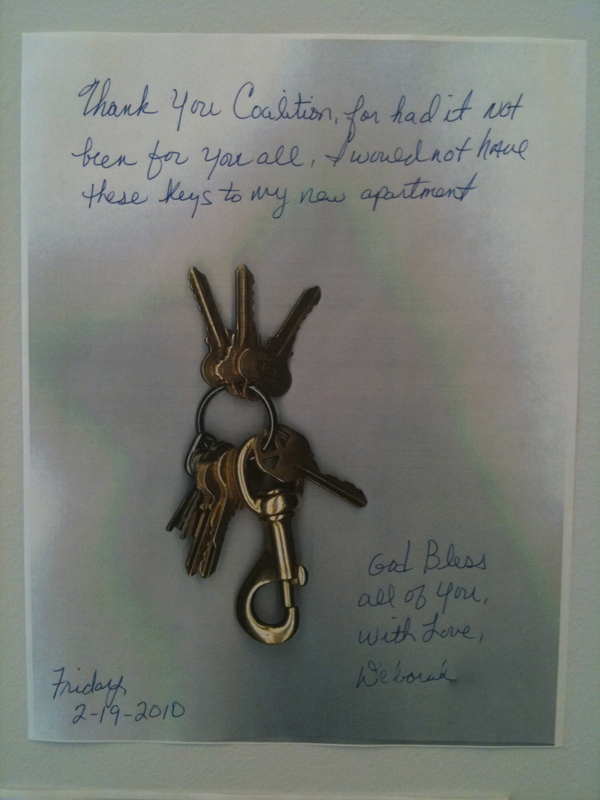 I explained to him that if other clients saw it, it might inspire them to hang in there a little longer until they got their own keys. Mr. Franklin didn’t hesitate. “Go for it.” With Mr. Franklin looking on, I taped the picture of his keys right in the middle of the wall. We stood there for what seemed like the longest time, just staring, and smiling. I turned to Mr. Franklin and shook his hand. He smiled back then, for the first time, gave me a hug. It was one of the most beautiful moments of my life. From that day forward, every single client who came into my office looked at those keys up on the wall. Some of them just stopped and stared, taking it in. How profound, how potent a symbol to the end of homelessness. Several of the clients would tear up. 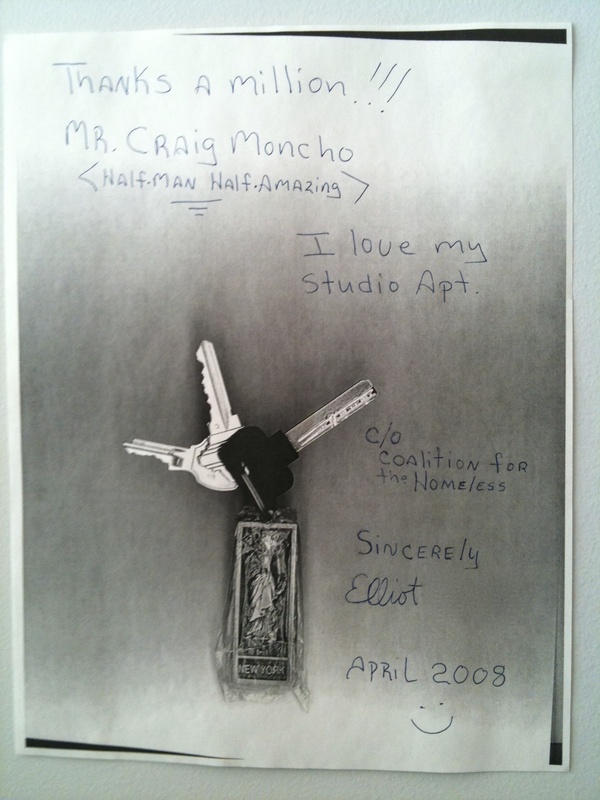 A week later I was sitting with Ms. Carol, who had just gotten a room in a supportive housing residence in Queens. She leaned in, like she had a secret. I made the copy, which she signed, and let her choose her spot on the wall. She chose a spot directly below and a little to the right of Mr. Franklin’s. Ms. Carol couldn’t have been more proud! Craig is a Social Worker licensed in the state of New York, with specializations in homeless services, mental health, and housing. He also had a successful psychotherapy practice in New York City, where he worked with individuals and couples. This entry was posted in Uncategorized and tagged affordable housing, case management, Coalition for the Homeless, disability benefits, homelessness, mental health, non-profit, not-for-profit, Poverty, program management, social work, social work students, social workers, SSI, supportive housing. Bookmark the permalink. I have joined yourr rss feed and sit up for in search of more of your magnificent post. Thank you for your kind words, and for taking the time. It is my hope to continue as much as my schedule will allow! Thank you, too, for sharing my site in your social networks. Very kind of you! Thanks very much for your comment, and I’m glad you are enjoying the layout. Actually, all I did was pull a basic theme from WordPress’s selection of free templates. Didn’t pay an extra penny. I created a custom palette, took photographs with my iPhone, and plugged them in. I think, though, that it’s time to rotate some new photographs through, to keep things fresh. Thanks again, and I hope to give you more reasons to stop by, in the future. Very inspiring. You are making a difference in lives that are then making a difference in more lives. It doesn’t really get much better than that! Anne, thank you so much! It was a true privilege. “You saved my life. I love my apartment. Thank you.” Helping someone who is homeless find a place to live is saving a life. — T.J. Thanks for that—and for the reblog. What a great idea Craig- inspiring on those dispiritng days that we all have. It was just one of those things that can happen when our clients trust us enough to show their hearts. Mr. Franklin gave a gift not only to me, but to so many who followed. I think he would have been astonished to see what he started. For me… I wound up with the best wallpaper in the building! Tony, thanks so much. You have so many choices as to what to read, I truly appreciate you taking the time.